One of the products I use every single day (and have used for over 40 years) are the heavy glass Pyrex measuring cups. I remember these from my childhood too, because both my mom and grandmother used them in their kitchens. 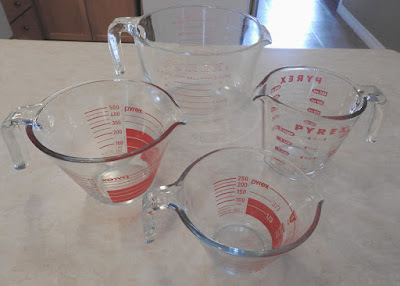 While there are other similar measuring cups, those that are plastic are often a lot less durable, particularly if you need to "nuke" (microwave) something in them. Some plastics just won't withstand use in the microwave (some of the cheaper hard plastics), and some of them won't withstand dishwasher use. While the cup might survive the dishwasher, the markings will likely disappear after a few washes if they are embeded in the plastic. I've tried lots of different ones, and usually end up grabbing my pyrex instead. Pyrex withstands most things - microwave, and dishwasher proof. My oldest measuring cup (41 years old) still has it's markings, though it's been exposed to the dishwasher for at least 35 years. While the Pyrex measures tend to be more expensive, for the long haul, they are worth the money. The oldest one I own is also the largest - it's 8 cup capacity makes it pretty useful for more than just measuring. It's bowl shape, with handle lends itself to use as a mixing bowl and I've used this to mix up 4 or 5 pounds of ground meat for meatballs; used it to make cakes and muffins and cookie dough. And of course, it it's useful to measure out larger quantities of liquid too. Faded as it is, it's endured the test of kitchen use for a long time. shaped measure. The wider mouth makes it easy to use, but the best feature of these is the inside markings. 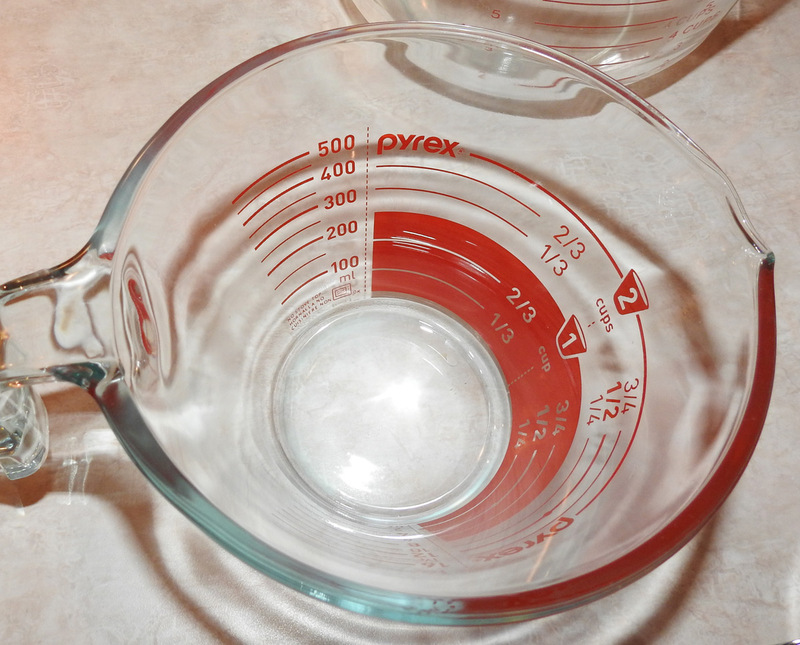 These liquid measures are marked on the inside and adjusted so that when you look into the cup, you can read the measurement, as opposed to having to kneel down to countertop height to read the measurement from the outside, as you would on the older standard Pyrex measures. 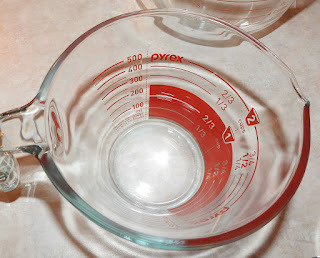 I suppose it seems strange to make such a fuss over measuring cups, but because they are so durable and they are glass I tend to use them for lots of other things besides measuring liquids (oh, no - don't use them for dry measures because there's a difference between how liquid and dry measuring cups measure). A 2-cup measuring cup makes a fine kettle to boil water for a cup of tea, and takes next to no time in the microwave. I use them to melt "things" in the microwave - everything from butter to chocolate chips, peanut butter or marshmallows ... and used them in the microwave to keep gravy warm while all the stove burners are busy cooking other things. Multi-purpose kitchen tools make the best and longest lasting choice. Opt for durability and flexibility when choosing your kitchen ware and you won't be disappointed.